Join your neighbors for a great dinner and conversation about the future of Argyle Street at Pho Loan, 1114 West Argyle. It all takes place tonight between 6pm and 9pm. Thanks to the proprietors, the 48th Ward office, and Axis Labs for their continuing support of this monthly program. "Loan Thị Thu Nguyễn, hailing from a line of Phở cooks in Vietnam, and her husband, Quang Minh Lê, took the long route to realizing their dreams of becoming restauranteurs in the United States. The two came to the United States in 1995 and lived in California for one year before moving to Chicago. With limited resources and a need to make a living to support their family, both Loan and Quang worked in the nail industry as nail technicians. Their true passion has always been to follow their family’s footsteps in showcasing Vietnamese cuisine as cooks and restauranteurs. 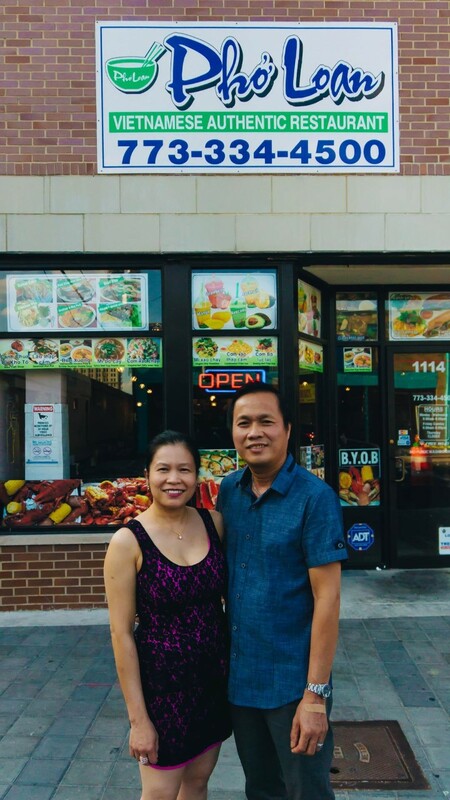 After years of building financial stability, the couple had the opportunity to realize their dreams when they opened Phơ Loan in 2014 at 1114 W. Argyle Street. 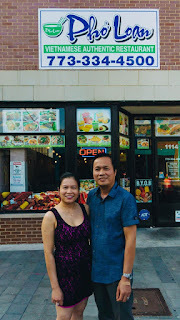 As the name of their restaurant indicates, Phở is their specialty. Phở Loan will be highlighting three different varieties of Phở not often seen at other Phở restaurants. Phở Gà Tươi, or free range chicken Phở, is a slightly lighter, more delicate chicken version of beef Phở. Phở Loan will be also showcasing two nhậu dishes. According to Quang Minh Lê, “Nhậu is the communal act of eating and drinking together and is common throughout Vietnam. After a long work week, friends can meet and connect over good food and beer or liquor; it is the act of building relationships between people.” The two nhậu dishes highlighted will be a Louisiana-Vietnamese style seafood boil, which is adapted from the Louisiana seafood boil to align with a Vietnamese palate and taste with an addition of a special sauce and Gổi Đu Đủ Tôm, Papaya Shrimp Salad. 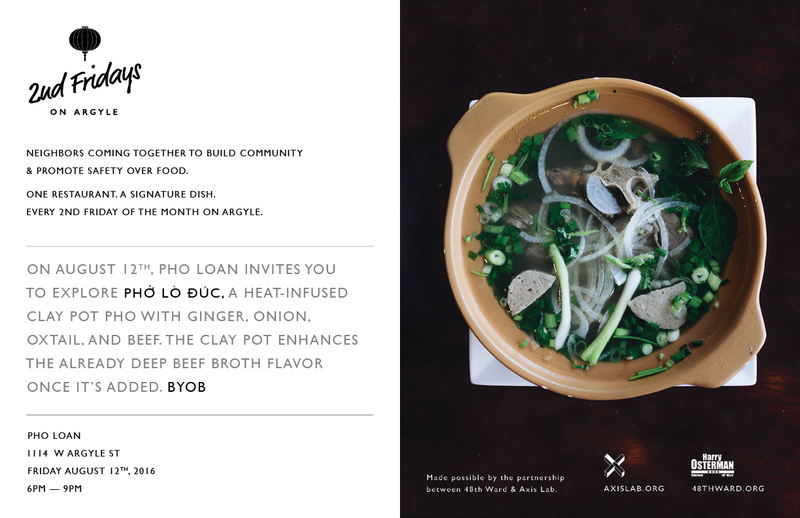 Join the 48th Ward and Axis Lab for this month’s 2nd Fridays initiative at Phở Loan located at 1114 W Argyle Street, Chicago, IL 60640.